The perfect coffee table book for any style home. A photo book made for Bud Puckett of all his work over the years and his great craftsmanship. 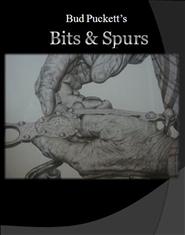 Bud Puckett is a amazing silversmith and designer of custom horse bits and spurs. He is from Mariposa Ca. The book was put together by customers and friend!